For the purposes of guiding through the relevant upgrade steps in a succinct manner, we won’t be making big changes to the source and target environments. In the diagram above we’ve a single source server – LJD-E1401. This is our Exchange 2010 server and could quite easily be split roles. 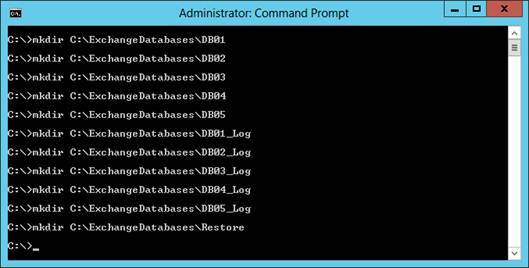 You can add in additional components if you need them, like Database Availability Groups. High Availability in Exchange 2013 is relatively simple compared to Exchange 2010 as concepts like the Client Access Array no longer exist – all communication is HTTPS and no affinity to a server is required. However – we’ll keep it simple in this guide. We’ll start with defining names for Exchange. 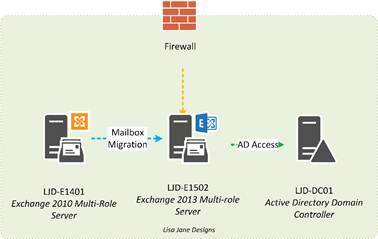 Migration from Exchange 2010 to Exchange 2013 allows us to use and share HTTPS names for AutoDiscover, OWA, ActiveSync and other services. This allows for a smooth transition with minimal co-existence. 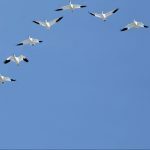 For our migration we'll therefore plan not to use a coexistence namespace, and simply move the current HTTPS namespace across to the new platform. As a bare minimum, Exchange 2010 must be running Service Pack 3 before installing Exchange 2013 into the domain. Exchange 2010 SP3 is available from this URL. For the best experience, ensure that Exchange 2010 SP3 also has the latest Update Rollup, currently Update Rollup 9 at the time of writing. This is available from this URL. Exchange 2013 supports Outlook 2007 and above on Windows, and on the Mac, Entourage 2008 Web Services edition and higher versions of Outlook for Mac. Ideally update all supported clients to the latest version, or upgrade to Office 2013 before migrating to Exchange 2013. All versions of Office 2013 are supported, along with Outlook 2010 Service Pack 1 with at least the November 2012 update and Outlook 2007 Service Pack 3 with at least the November 2012 update. Outlook 2003 is not supported, and clients running it must be upgraded before moving associated mailboxes to Exchange 2013. In part 6 our series, "Planning and Migrating a small organisation from Exchange 2007 to 2013" we covered how to use the Exchange Server Role Requirement Calculator to determine the sizing required. We will not cover the same steps here, but instead examine the inputs and associated outputs from the Calculator. We'll use those figures in the Exchange 2013 Role Requirements Calculator to determine the requirements for the Exchange 2013 deployment. 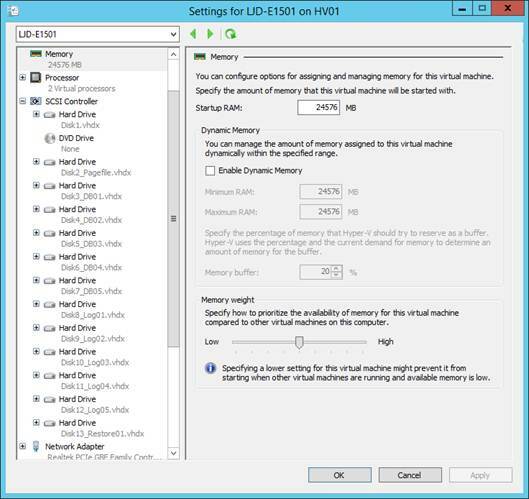 The solution will not have high availability and instead will use Hyper-V for high availability. The Exchange 2013 environment will provide quota limits of 10GB per user. The Virtual CPU specifies how many CPU cores should be assigned to the Virtual Machine used, as does the RAM. The OS disk will hold both Operating System Exchange install and transport databases. The Physical Disks represents how many of the available physical disks are needed to actually support the deployment and meet requirements for performance and space. In the virtual environment, these will be presented as virtual disks and will be used for database and log files respectively. You'll note that we're still splitting databases and logs. For an implementation making use of Exchange Native Protection we wouldn't look to do this, but for an implementation in a virtual environment that takes advantage of backups this is still required. We've also included an additional virtual disk to use as a restore LUN. Splitting Databases from logs ensure that in the scenario of a log disk filling up, databases will not be corrupted. By splitting databases we also ensure that losing or the corruption of a virtual disk doesn't result in a full restore of Exchange. 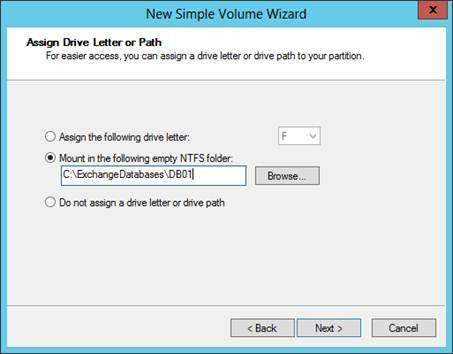 Exchange 2013 supports Windows 2008 R2 to Windows 2012 R2. In our series we'll use Windows 2012 R2. We'll then proceed and install Windows Server 2012 R2 on the virtual machine used for Exchange 2013, then configure it with correct network settings, install the latest Windows updates and join it to our domain. Exchange 2013 expect disks - virtual or otherwise - to be formatted in a particular way to ensure best performance. 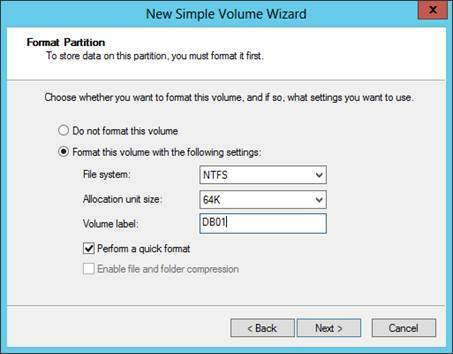 To accomplish this we will need to ensure that disks are formatted with a 64KB NTFS allocation unit size. 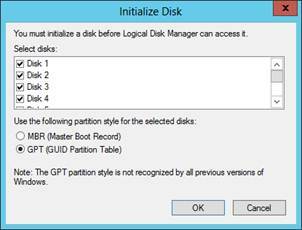 Within Server Manager, navigate to Disk Management. We will see in the upper panel the system disk, C: and the System Reserved Partition. These also display in the lower page, contained as partitions within the primary disk. After choosing the drive letter, we’ll then move onto formatting our first disk. It is recommended to use 64KB allocation unit sizes with Exchange. This helps with performance, as Exchange will be reading and writing large database block sizes, large log file sizes and uses lazy commits. Rather than break the writes into smaller, unnecessary chunks we will use the largest unit size possible. This is mirrored somewhat with Page File disks as although memory pages are 4KB in memory they may be flushed and returned in bigger chunks. 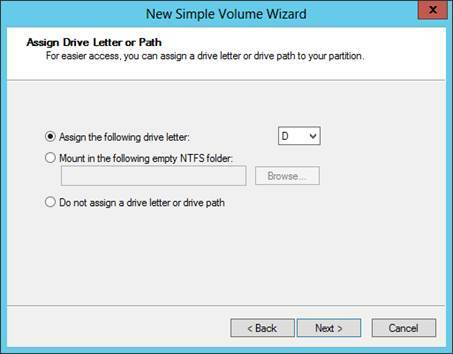 After formatting the page file volume, move straight onto our database and log volumes. We need to first create mount points, which we will create on our system drive using the values specified in the table above. In the first part of this series we’ve defined the server specifications for the Exchange 2013 server that we’ll migrate to, then installed and configured the base operating system and disks. In the next part of this series we will complete the server configuration then install and begin configuration of Exchange Server. Just completed all four parts of this series today. Everything worked great. Thanks for the fantastic detailed instructions.